Sarai Pulido aka. 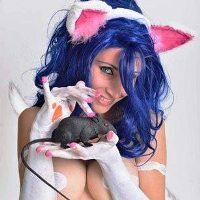 Morgana Cosplay is Cosplayer and Body Painting model from Spain who tries to become a profesional cosplayer, or in other words, a girl who tries to make her dreams come true. Felicia was first introduced in Darkstalkers: The Night Warriors as one of two female characters along side Morrigan Aensland. She has appeared in every game in the series and in numerous cross overs including Marvel Vs. Capcom 2 along with Morrigan, B.B.Hood and Anakaris.